My wife and I are right in the middle of preparing for a huge catering event this weekend in Sonoma. 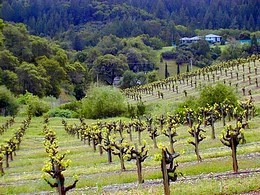 It’s called “Passport to Dry Creek Valley,” which is an annual event showing off the wines, and vineyards, of the beautiful Dry Creek Valley (photo from visitwineroad.com). We will be doing the food for our dear friend Bill Frick, at the amazing Frick Winery for the 12th straight year. Despite all the planning and prep work, it's a lot of fun and we always look forward to it. There are over 50 wineries involved in this event, and thousands of wine enthusiasts will be eating and sipping their way through the valley. By the way, if you have a chance, check out the Frick Winery website. Bill produces some of the most delicious wine in California. Due to the limited time to film clips and write articles, there will probably not be any new videos until after the weekend. I may do a couple posts before I leave, especially if any new About video recipes air, but no promises! This will be the perfect time to review your favorite recipes and make sure you haven't missed any. Don't forget to use the google search box in the side bar to find the ingredients you are interested in. Enjoy! Will you please show us photos of the food you are pairing with the Frick Wines? Some of us can't get there and even if we could, I just checked the Dry Creek Valley website and the Passport event is "SOLD OUT"! C'mon, "show us what you got!" yes, it sells out every year! We will take pictures during the event and will post them for sure. Chef John, this is random and off topic regarding your current post, but my husband and I just want to hug your neck for your wonderful mayonnaise video on youtube. We have tried and tried but could never get homemade mayonnaise to turn out right - until TODAY! Today I saw your video, and tried it just as you demonstrated, and let me tell you, it came out PERFECT! We are so thrilled and grateful to you! We don't have a youtube account so I just had to comment here to thank you. Bless you for teaching us how to have fresh, wonderful mayonnaise without all the unnecessary additives that are in much of today's processed food. Thanks! BTW, please use this site to view the videos and to comment. Only a part of my content is posted on YT. Happy cooking!